About 6 months ago I heard about Hangout Festival on Lightning 100, a local Nashville radio station and instantly wanted to go. The line up was incredible, and I was especially excited to surprise my husband with the chance to see one of his favorite bands (that he’d never seen before! ), Modest Mouse. Unfortunately, Hangout Fest was the same weekend my cousin & my best friend were both getting married… so my schedule was quite full. Needless to say, there was NO way we were making it to Gulf Shores that weekend. Slightly bummed, I decided to get creative and see if Modest Mouse was showing up anywhere else this summer. Turns out they’d be four short hours away in Atlanta at a festival called Shaky Knees. The festival ran May 9th through May 11th and was being held at Atlantic Station (near the Atlanta Ikea). The line up was pretty stacked, so we bought tickets and at $169 for a 3-day pass, I’d say it was an excellent deal. 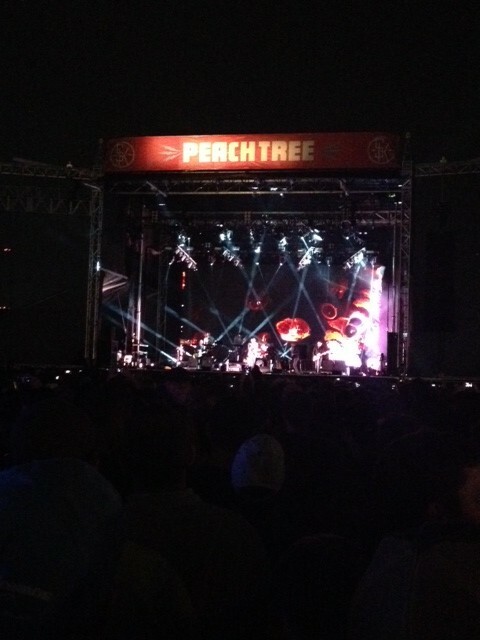 Let’s talk music: The National, Modest Mouse & Alabama Shakes were the closing act (each night, respectively). Other power players include: The Lone Bellow, Lord Huron, Portugal. the Man, Conor Oberst, Spoon, Cage the Elephant, Dawes, Wild Belle, Gregory Alan Isakov, Band of Skulls, Cold War Kids, Gaslight Anthem, Iron & Wine, Airborne Toxic Event & a whole lot more. My favorites: Lone Bellow (if you’ve seen them before, you know why! ), Dawes & Spoon (talk about a FUN SET!). 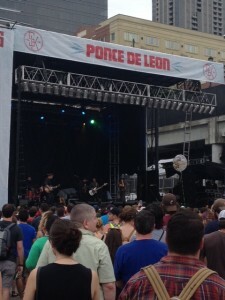 The Lone Bellow on day 2 at the Ponce De Leon Stage. Spoon on day 2 at the Peachtree Stage. Let’s talk setup: When I hear the festival was in Atlantic Station, I had no idea where it would actually be. If you haven’t been, Atlantic Station is a nice, outdoor shopping area with vendors like West Elm, H&M, Gap & California Pizza Kitchen…. not exactly screaming “music festival,” however, I really liked the set up. There are four stages, two East and two West, and only one per side playing at the same time with never more than two bands playing simultaneously. And even when two bands you wanted to see were both playing, it only took 2 minutes to walk back and forth to the stages…. but sonically, you couldn’t hear the other. The acoustics were AMAZING. There was no sound floating into space (as my experience has been in open fields or the desert…), it was contained and preserved for your listening pleasure. My husband (a former tour manager) was convinced they were using the highest quality sound equipment available, and it definitely showed! Let’s talk perks: This particular weekend it happened to rain a LOT. I’ll say I was glad I wasn’t at Bonaroo, because pavement is a lot easier to deal with in the rain. When it started pouring around dinnertime, everyone escaped to restaurants in Atlantic Station to dry off and get their energy back up for the closing act. All of the vendors were offering discounts & were welcoming to the soaked, tired festival patrons. Another perk for those of you who are weary about camping & festivals, there is no camping option here. There are, however, several hotels within 1 mile. We stayed at one about 1.3 miles away and walked to and from the festival. The entire festival was really organized and user friendly. 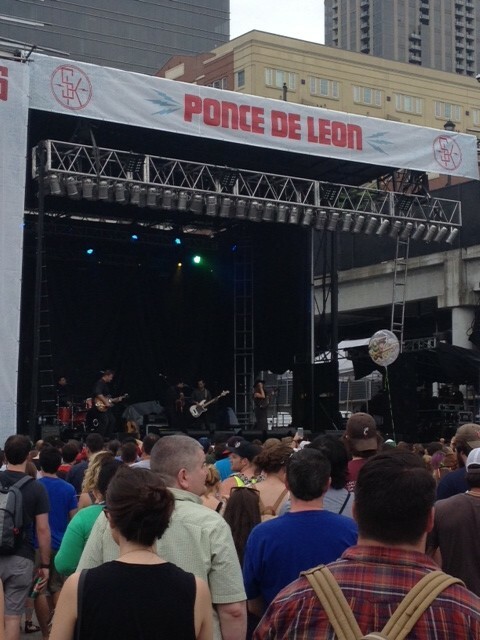 Overall, we really enjoyed Shaky Knees. It will be on my radar for next year as a must-go. I would especially recommend this to someone who is hesitant to try a festival for whatever reason; this would be a great way to get your feet wet.